During World War 1, many clashes occurred in rural parts of Western Europe, due to the trenches and amount of ordinance dropped, previously picturesque countryside turned into bleak, muddy environments where few things could grow. Despite the war and destruction, red Flanders poppies appeared across many of these fields and quickly became a symbol of resilience and defiance inspiring on Lt Col John McCrae to write a poem. The Lt Col penned a poppy-inspired poem in 1915 following the loss of a friend, titled ‘In Flanders Field’, in which the distinctive poppies are mentioned in the famous opening lines ‘In Flanders’ fields the poppies blow, between the crosses, row on row’. This, in turn, inspired the academic Moina Michael. Mona, while working overseas with the YMCA published her own poem in reverence to LT Col McCrae and the fallen. After publishing her poem she vowed to always wear a poppy in memorial. During a conference in the same year she wore a silk poppy, and handed them out to the crowd, including a French woman, Anna Guerin. Anna designed the poppies to which we are all so familiar and, in 1921, she sent her poppies to London where they were formally adopted by the Royal British Legion. 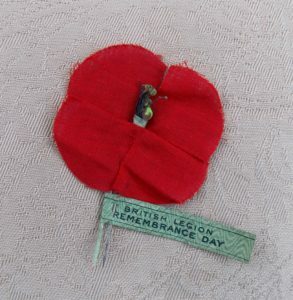 Nine million of these poppies were sold by the British Legion on 11th November 1921. The money made from the poppies was used to help former soldiers to find employment and accommodation after the war. A poppy factory was opened the following year, and this factory still produces millions of poppies annually. The poppy is worn by millions of people each year as a sign of Remembrance and hope. Money raised from poppy sales is still used to help veterans as well as people currently serving in the Armed Forces and their families. Wearing a poppy does not necessarily mean you support war and the poppy is not a symbol of death. It does not connect you with any religious or political movement, and the colour red does not signify blood. Poppies are used to commemorate those killed during wars and are also worn in countries including Canada, New Zealand and Australia.